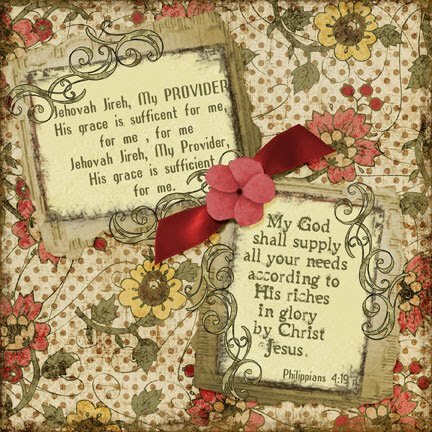 Again for this Challenge at Faith Sister, once I read the word "Provider" a favourite chorus of mine came to mind so I included the first half of that chorus plus the Bible verse it is based on. The digital kit I used is called Affections of the Heart by Deanna Patterson and is available at Nuts 4 Digi. That chorus is so much a favourite of mine that I have asked my husband to have it sung at my funeral. The words are great and the tune is so lively.. when I sing it, it makes me want to dance which I do subtlely move my feet about whenever I lead that song at Church. Lots of wonderful pages, here, Anne-Marie. I just love this last one, though. That is a beautiful kit.